Jamie Clarke, guitarist, singer and the soul of perfect was born in 1964 in the middle of nowhere and destined to go places. Moved to Camden, the heart of London and the centre of the music world in 1987. He started his career with 80's poptastic "Innocence Lost" and ended up touring the world with famous Irish folk punk band "The Pogues". 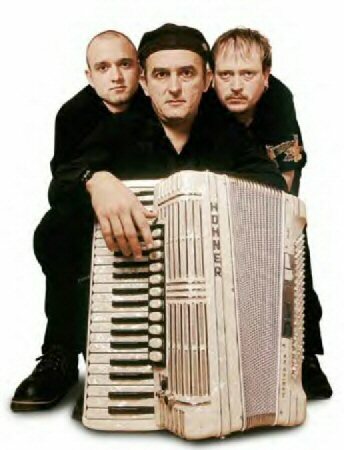 Pedja, the award-winning Bosnian high speed accordion player brings an exotic flavour to the traditional folk-sound of perfect. He came to Germany as a student, till he met the friend of a friend, of a friend in a German-course, who knew someone, who was at the time looking for an accordion player to set up a new folk group. That of course was Jamie, who at that time was experimenting with drummer Jochen Ritter, who left the band in summer 2000. They all liked each other and started working together. Andy Schabinger, the new drummer, was found with the help of the internet, that wonderful new toy of all computer-owners. He's a young lad from Bodensee, who likes to do new things with his drums. He enjoys the PERFECT-Style and brings a lot of creativity and amazing talent to the band. With his brandnew "cocktail-drum-kit" (oh my god, it's sparkling silver...!) he also adds a trendy cool look to the band's legendary stage-show. Perfect have successfully played more than 200 concerts all over the world. Their famous action-packed live show is a perfect mixture of their own material and some Pogues classics. Soon, you will find some press-comments about the band and their show on this page. For all their releases check the discography. Né à Banbury en Angleterre, établi durant plusieurs années à Londres (avant d'émigrer sur les bords du Rhin), compositeur, leader, guitariste rythmique et producteur, Jamie Clarke a joué dans des groupes qui se sont fait une renommée, tels: "Innocense Lost" et "Pogues". Avec Perfect, Jamie s'est entouré de Predrac Zaric accordéonniste bosniaque - les désordres dans l'ex-Yougoslavie l'ont poussé dans les bars les plus sombres de karlsruhe où il s'est fait un nom grâce à son don incroyable et sa rage de jouer endiablé. Il est maître dans sa manière et n'apporte pas seulement sa contribution aux mélodies simples du groupe, maus joue aussi la partie vasse avec son instrument qui donne au son de Perfect son carractère bien à lui. Batteur, Andy Schabinger complète le groupe. Perfect profite largement de la diversité culturelle de chacun de ses membres et crée, par le biais de ces traditions musicales très différentes, un style tout à fait nouveau et à un caractère innovatif. De Karlsruhe à Portland (USA) Perfect facsine et emballe par son style bien singulier de folk, punk, rock.